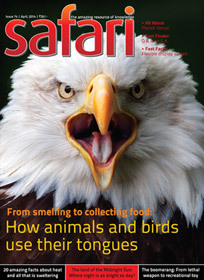 The cover page of Safari – a knowledge and science magazine from India – April 2014 issue, gives us a look of a wildlife magazine at first glance. Here is what it contains and what are my views about the content of the same. According to me an editorial is a kind of face of the magazine. As it represents editor’s views about the content of the magazine and/or his thoughts at the time of publishing or preparing and editing the content of the magazine. The issue doesn’t have the editorial. In current time, mobile phones became a necessity. And rather than using it just for calling and texting, we use it for a lot of other purpose also. With the rise of Smartphones, it became our virtual office assistant, our communication gateway, virtual money wallet, digital camera and much more. It also makes it very precious and we cannot afford to loose it or the information stored within it. A one page article titled Lost or stolen Smartphone: How to find, trace or erase it is a good read. We expected the article to be longer and contain more stuff. The roots of touch-pad, touch screen and other way of input in computers lies somewhere in mouse. It was the first device which let user perform some actions which are visual and not just a key-press from the keyboard. The rise of GUI is thankful to this revolutionary device. 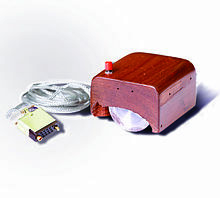 A lot of us may not know that the invention of mouse was done by Douglas Engelbert(January 30, 1925 – July 2, 2013) in 1964. 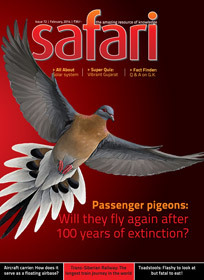 A small introductory article about mouse is there in the magazine. The article about Honey-guide and Honey badger is mainly for nature lovers. The article about – Contact Lens – is interesting and informative, it is definitely worth reading for everyone. Same we can say for the 5 facts about Airbus A380. Mother Earth holds a large amount of Natural wonders! One of that is the northernmost place where people live in a stable village -Ny Alesound. It is the land where night is also as bright as day! Yes, because of its exposure to Sun throughout Earth’s spinning, this can happen. A 3 page article by Samarth Vyas about this place is good to read, and to add to that the article have map, photo and illustration of various stuff discussed. Those who like to keep their – information diary – updated; the article – Twenty things you did not know about heat and all that is sweltering – is interesting one. We use tongue to speak and taste the food mainly. We know that some animals like dog uses it to manage the heat level in its body. We often see them sitting in – open mouth, tongue out, breathing heavily- situation doing that. There are various ways (and purpose) the birds and animals use their tongues. A detailed article about is found written by Ravindra Acharya on the same topic. The article contains images whee needed. The writing style of the author is quite good as well. The article is found interesting mainly by those who love biology (or want to update their knowledge). A small yet informative – Fast Fact – segment of this issue brings information about Flexible Display Screen. May be it will be used by future mobile phone and other wearable gadgets. The article rather than just providing abstract information, brings in the facts about the technology used for the purpose; which is the positive point. In hot situations we use fans, Air-coolers, Refrigerators, Air-conditioners,… And in cold Woolen cloths, heaters etc. comes to our rescue. But what about the plants and trees? How they survive in such situations? If these are the questions came to your mind ever; you may like to go for the article by B. M. Purohit where he discusses about the plants that creates its own greenhouse effect to survive during the cold. The article is written in nice way. When we think about the earlier toys we were fascinated with; one name came to mind is Boomerang. We saw it used by several fictional popular characters like Mowgli (from The Jungle Book). It is basically one of the basic and important weapon used by humans from the Jungle era. Also talking about Boomerang and not talking about Australia is not possible, as it is the famous fact that the tribal people of Australia uses it effectively. An article about this will interest kids and young adults the most. Since long we are talking about alternative fuels and even using electricity and solar energy to feed the vehicles. Though nothing practically useful for masses came out there at large scale yet. It is interesting to note that a Solar car race was happened where they drove thousands of Kilometers in Australia without a drop of conventional fuel. It rises the hope of using Solar energy as fuel and confirms that it is practically possible. The article is a good read for everyone. As such stuff will affect our future, we must keep our heads up knowing more about the progress of Alternative fuel solutions. What is the size of the human DNA molecule? Is it true that sprouted potato is toxic? Is it safe to eat such potatoes? Which is the oldest living tree in the world? Width of railway tracks (track gauge) in most of the western nations is 4 feet & 8.5 inches. Then why is it 5 feet 6 inches in India? Why do dogs chase cars and other fast moving vehicles on the road? Raw Papaya ripens when put inside a plain paper bag. What is the scientific reason for this? If a human being is completely at rest, how many calories are burnt by the body? On what grounds do scientists believe that there ever existed a life form on Mars in the distant past? The good thing about this section in this issue is it talks more about the day to day stuff. All about Venus – the last cover page article – brings all the information a common man need to know about the same planet. Overall the issue is worth reading as it contains really genuine reading material. It is definitely worth for the time and money spend for the same.